A term meant to indicate inclusion within the history,traditions, and protocols of Academia, otherwise known as the university system of intellectual and cultural elites. At times, to be academic is to be considered progressive, even radical. At others, it is to be perceived as retroactive, reactive, and conservative . 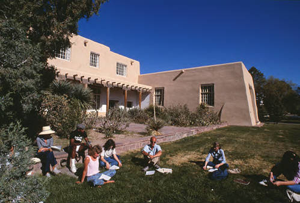 "A group of students seated in front of Zimmerman Library on the University of New Mexico campus," photograph from Department of Facility Planning Records (acc 028 066 076), Center for Southwest Research, University of New Mexico.